While visiting a town a peddler named Kraft Lawrence meets the local god known as Holo the Wise Wolf. She asks if he would take her to her home up north and many adventures happen along the way. Kraft Lawrence alongside Holo the Wife Wolf learn much about the economics of the world they live in, with money taking a central role. Kingdoms produce their own currency, yet one kingdom is making their coins lighter and worth less silver. This could signal the decline of a kindgom, a future war, or something far more sinister. 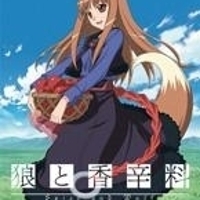 4055 users rated Spice and Wolf [TV]. Return to Spice and Wolf.